This past weekend CANSEE held its first ever graduate student research symposium for emerging and early career Ecological Economics scholars. After two intense days in the University of Waterloo classrooms, the students headed north to a remote rural farm in Honeywood, Ontario for another day of team-building and leadership exercises. To the students’ surprise, the facilitators were four-legged powerhouses averaging approximately 2,000 pounds. Walter Winchell, America’s foremost newspaperman once defined leadership as “the capacity to translate vision into reality”. Creating relational bonds with horses to achieve a set of goals as a coordinated team might possibly be the best way to test, challenge, and grow this capacity. A special thanks to Rawhide Adventures for hosting, and to Victoria Poe and her assistants from 2LeadChange for facilitating! EFL is “a unique modality of experiential learning for personal growth, learning social and emotional intelligence skills, and leadership and team building skills[i]”. 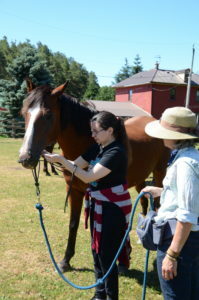 From counselling services and trauma recovery to leadership, career, and team development, equine-facilitated learning and healing has brought forth innovative approaches to these skills-building services. By engaging directly with horses through a variety of activities and methods, participants learn to build and express a sense of trust, empathy, and enthusiastic energy in order to communicate direct objectives to their partners – both two and four-legged. Using non-verbal cues and embracing a more conscientious form of self-awareness, humans and horses are able to build a relational bond that can facilitate a socially and emotionally intelligent, nonpredatory approach to leadership. Although only 10 percent of human interpersonal communication is verbal, our society is heavily reliant on the use of words to fully express our feelings and sentiments. Linda Kohanov, author of The Power of the Herd: A Nonpredatory Approach to Social Intelligence, Leadership, and Innovation, argues that this reliance systematically erodes our relationship with our physical bodies and the environment, blinding our senses to the heightened awareness needed for detecting nonverbal cues. Emails, social media postings and text messages are often seen as efficient tools for humans to effectively communicate. But what about the other 90 percent? The phenomenon of mirror neurons was first observed – accidentally, as most scientific discoveries are made – in the late 80’s when Italian researchers at the University of Parma were monitoring a monkey’s brain cells in relation to arm movements. One afternoon a grad student entered the lab with an ice cream cone in hand. As the student raised their arm to bring the ice cream closer to their mouth, the monkey’s own neurons lit up, revolutionizing our understanding of the physiology of empathy[ii]. It turns out, mammalian brains are wired to observe and detect the emotional state of others: “We are exquisitely social creatures. Our survival depends on understanding the actions, intentions and emotions of others. Mirror neurons allow us to grasp the minds of others not through conceptual reasoning but through direct simulation. By feeling, not by thinking” says Dr. Rizzolatti, neuroscientist from the University of Parma. The phenomenon of mirror neurons has directly challenged numerous scientific disciplines and shifted our approach to cultural conceptions of language, philosophy, psychotherapy and autism. One area in particular this research has directly impacted is that of effective leadership. Though the concepts of social and emotional intelligence are only beginning to make their way into educational and training programs, they are nonetheless pivotal for shaping future visionary leaders. In a study published in Leadership Quarterly[iii], employees were provided with feedback from management that either a) gave an overall negative performance review with a positive emotional delivery (smiles, nods), or b) gave an overall positive performance review with negative emotional delivery (frowns, narrowed eyes). As predicted, employees provided with the negative performance review felt more optimistic after the feedback than those provided with a negative emotional delivery of positive performance. “In effect, the delivery was more important than the message itself” says Daniel Goleman and Richard Boyatzis in their Harvard Business Review article on social intelligence[iv]. “The old carrot-and-stick approach alone doesn’t make neural sense; traditional incentive systems are simply not enough to get the best performance from followers”. As herd and prey animals, horses are highly attuned to their surroundings through “a nuanced form of relational biofeedback[v]”. Their methods of communication go well beyond our understandings, particularly when we take such a limited view on effective communicative means (i.e. verbal, written). Horses are constantly in check with the emotional atmosphere surrounding them, reading and responding to a multifaceted set of cues and somatic impressions that continuously keep them informed about the state of their herd members and the surrounding environment. Going beyond the herd, the impact of non-verbal cues on human-horse interactions are quite astounding. In a study conducted at the Swedish University of Agricultural Sciences[vi], inexperienced riders were asked to lead a horse back and forth between a thirty-metre distance four separate times. Both horses and humans wore heart monitors to record the heart rate of all participants. During the final stage of the experiment, the participants were told an umbrella would be open as they led the horse past the assistant. Though no umbrella was open, and no behavioural differences were observed in either the participant or the horse, the heart rates of both human and horse participants rose significantly as they passed the research assistant. Working directly alongside horses can bring about all sorts of revelations regarding body language, emotional states, and energy levels. As the experiment outcome found, horse’s neurons will actually mirror our own, resulting in a range of behaviour that may come to us as a complete surprise since we may not be as in tune with our own interior feelings as we may think. That’s right – horses can physiologically mirror the emotions of the human interacting with them. In fact, horses will become noticeably agitated by people who are internally “incongruent” – those attempting to conceal negative emotions beneath the surface with a happy face. Once the person is able to openly acknowledge the suppressed feelings within (introspectively), the horse will respond with more relaxed behaviour[vii]. The goal of EFL is to create intersubjective awareness – “paying attention to your own nonverbal experiences and body language cues and those of the people you’re interacting with at the same time[viii]”.Though contemporary approaches to business and leadership emphasize the importance of objectivity and compartmentalization, the universe of information available to us in the non-verbal realm offers unparalleled potential for truly collaborative, considerate, and effective methods of communication and problem-solving. As Goleman and Boyatzis reflect: “the leader-follower dynamic is not a case of two (or more) independent brains reacting consciously or unconsciously to each other. Rather, the individual minds become, in a sense, fused into a single system. We believe that great leaders are those whose behavior powerfully leverages the system of brain interconnectedness”. As we’ll see below, it takes a lot of conscious effort to genuinely engage with the non-verbal realm. Thanks to our four-legged friends, we were given quite a unique opportunity to try. Thirteen members of our symposium event were able to attend the EFL session. After a few opening activities that worked to release nervous energy and ground the participants in the present, we headed to the horse pasture. 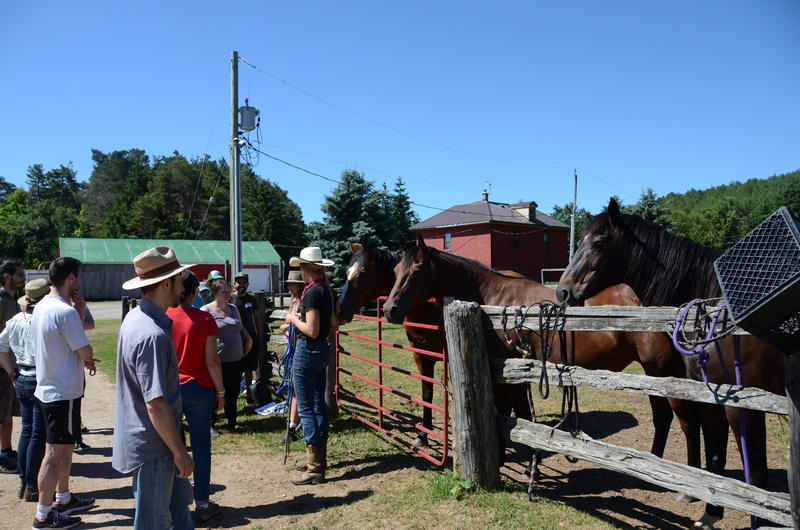 The first objective was for participants to meet and connect with a horse of their choice. The students were in small groups and had to decide, based on the energy and feedback they were receiving, which horse they wanted, and were welcome to, bond with as a group. After initial introductions, participants were then asked to halter their four-legged partner and lead them around the pasture. 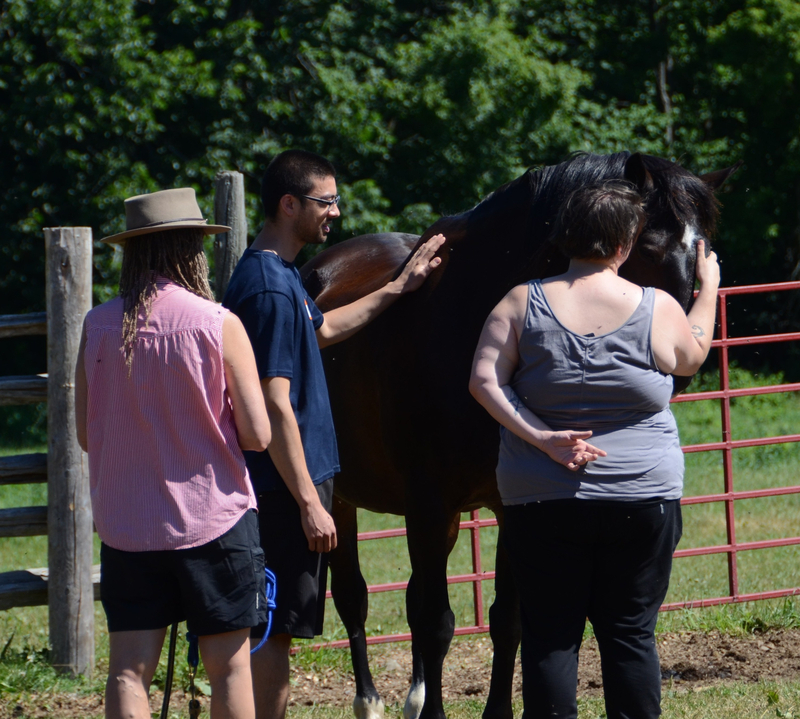 Many participants were able to create the space and relations needed for the horse to willingly follow their lead. In some cases, the nervousness or uncertainty expressed non-verbally by the participants was just enough information for the horse to know their two-legged partner was not prepared to safely lead them with confidence. 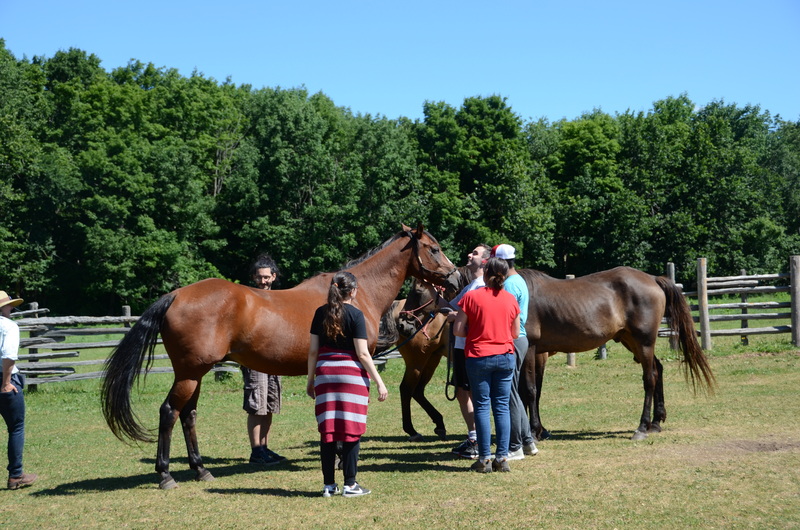 Nonetheless, the participants did their best to engage with the horses while beginning to observe their emotional state and regulate interior energies, whether positive or negative, conducive to a herd mentality. The second activity asked participants to work as a group to move a herd of three horses from one end of the pasture to the other. 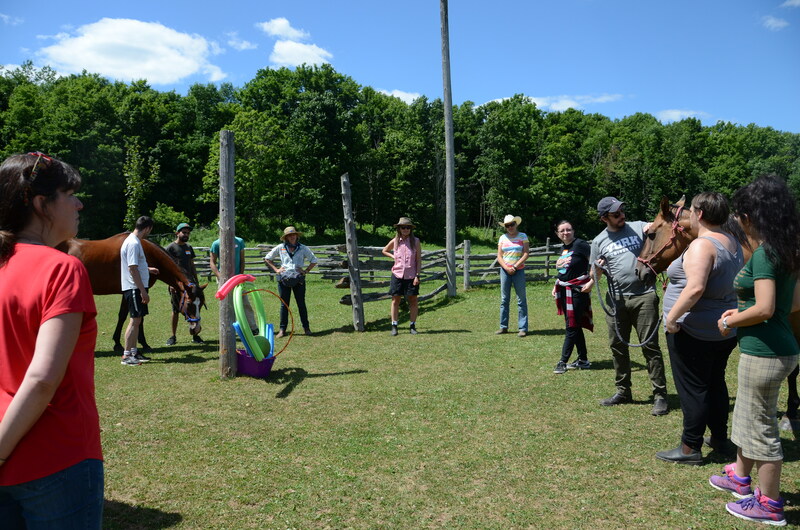 There was a catch, of course – the participants could not use any equipment, and while they could plan ahead and take time-outs throughout the session, during the actual engagement participants were not allowed to speak to each other or the horses. The participants had to rely on sounds, movements, and building positive energy to motivate the herd in the desired direction. It was an absolute delight to witness. To successfully move the herd, the group needs to build momentum and enthusiasm to engage with the horses, but also direct that energy towards a specific end-goal. Otherwise, as some participants observed, they became trapped in the likes of a ‘horse vortex’ where the various inconsistent signals sent the herd spinning on the spot. “It’s a game with completely new rules” one participant remarked. Multiple strategies, trials and errors were tested and quickly learned from as the groups attempted to engage with themselves, each other, and the horses simultaneously. Finally, the students were asked to reflect on the most relevant topic or objective CANSEE should consider for its upcoming biennial conference (May 2019). After a few minutes of brainstorming, they were asked to express their top choice through an impromptu sculpture-making project after which they then led the horses through to interact with their creations. 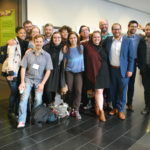 Regrouping the foundations of ecological economics, maintaining a viral online presence, and embracing complexity through systems theory were the top choices from the CANSEE 2018 symposium class. One of CANSEE’s main objectives as an organization is to empower Canada’s future leaders and thinkers within the discipline of ecological economics. Through mentorships, conferences and collaborative research efforts, CANSEE is working hard to ensure the next generation of Canadians understands the full scope of the financial, environmental, economic and societal crises. However, knowledge alone will not guarantee the success of this goal. Our future leaders must develop the skillsets needed to breach borders, bridge differences, and enact change – as a collective, for the collective. Facilitating a just transition to a low-carbon economy remains the greatest challenge our species has ever faced, and requires a coordinated, united front for decades to come. This implies, from the outset, harnessing the energy to inspire “reverence for a project you will never see completed[ix]”. Engaging in a non-predatory, socially intelligent approach to leadership demands relational dynamics that go well beyond simple superior-inferior hierarchies. The herd mentality requires strong, trusting bonds that empower all of its members to succeed. Most importantly, it underscores the interdependencies we share with the natural world and our pivotal role as stewards of the land, air, and water in protecting our shared and sacred home. [iii] Dasborough, M.T. (2006). ‘Cognitive asymmetry in employee emotional reactions to leadership behaviors’. Leadership Quarterly 17 (2): 163-78.